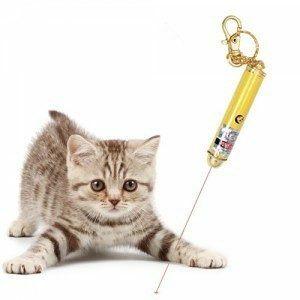 Laser Cat Toy with Batteries Only $2.99 Plus FREE Shipping! You are here: Home / Great Deals / Laser Cat Toy with Batteries Only $2.99 Plus FREE Shipping! Point the bright laser at the floor or wall and watch your cat try to catch his or her elusive prey! This cat toy promotes healthy exercise by engaging your pet in an entertaining, exciting way, while providing hours of fun! Watch your cat go crazy with this Laser Cat Toy with Batteries Only $2.99 Plus FREE Shipping! !